Looking for more information about Hilton Sandestin Beach Golf Resort & Spa? See below for answers to all of your frequently asked questions. 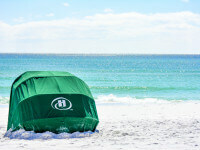 Where is Hilton Sandestin Beach located? Hilton Sandestin Beach Golf Resort & Spa is located at 4000 Sandestin Boulevard South, Miramar Beach, Florida 32550.The property sits directly on Florida’s beautiful Gulf Coast beaches and is minutes away from the area’s best shopping and attractions. Miramar Beach, Florida is 9 miles east of Destin, Florida and less than 40 miles west of Panama City Beach, Florida. How do I get to Hilton Sandestin Beach? You can fly or drive to Hilton Sandestin Beach. The closest airport is Destin — Fort Walton Beach Airport (VPS), which services Delta Airlines, United Airlines and American Airlines. Destin — Fort Walton Beach offers service to / from Dallas, Houston, Atlanta, Charlotte and Washington D.C. If you’re driving, take Hwy 98 to Sandestin Boulevard South. How far is Hilton Sandestin Beach from the beach? You can’t get much closer to the waves. 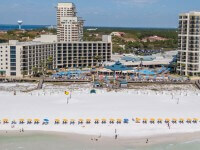 Hilton Sandestin Beach is located directly on the beach! Guests enjoy a pool deck overlooking the Gulf of Mexico and a white sand beach right outside our doors. Many of our rooms also offer decks overlooking the beach and the Gulf of Mexico. What is the best time to visit Destin / Sandestin? 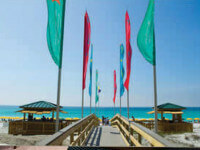 Destin and Sandestin offer comfortable temperatures and exciting things to do and see all year round. Summer months—our peak season—offer sunny days and average temperatures in the mid-80s, while fall and spring temperatures remain in the 70s. During the spring and summer it’s all about hitting the beach and enjoying a variety of aquatic pursuits or partaking in local festivals and events like the Grand Boulevard Farmer’s Market, South Walton Beach Wine & Food Festival and our yearly Fourth of July celebrations. In fall, many guests enjoy beautiful sunset views and smaller crowds. During the winter, guests enjoy resort amenities like our on-site spa, four-diamond AAA steakhouse and holiday brunches and celebrations. What is there to do in Destin and Sandestin? There is so much to do in Destin and Sandestin. Beyond the beach, Destin offers a variety of attractions, shops and restaurants. Sunset paddle boarding, bowling, mini-golf and go karts are all just minutes from Hilton Sandestin Beach. Big Kahuna’s Water and Adventure Park, Gulfarium Marine Adventure Park and a variety of natural attractions like Topsail Hill Preserve State Park and Henderson Beach State Park are also nearby. For shopping, visit Silver Sands Premium Outlets, Grand Boulevard or Destin Commons. Does Hilton Sandestin Beach host weddings and events? Yes! We host many weddings and other corporate or private events every year. To learn more about weddings at Hilton Sandestin Beach, click here. For more information about meetings—or to submit an RFP— click here. Does Hilton Sandestin Beach offer any vacation deals, vacation packages or spa deals? 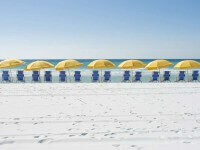 Hilton Sandestin Beach offers vacation packages all year round. We offer deals for families, romantic getaways, shopping adventures and more. Some deals are only offered seasonally, so act fast! For the full list of current offers, visit our Specials & Packages page. We also offer monthly spa specials at Serenity by the sea Spa, located on property. Monthly specials can be found on the Serenity by the sea Spa website here. You can stay up to date about the latest offers and packages by subscribing to our enewsletter. Where can I find reviews of Hilton Sandestin Beach? See what some of our past guests have said about Hilton Sandestin Beach Golf Resort & Spa on our reviews page.